One Fat Frog Restaurant Equipment sees several truckloads of used commercial restaurant equipment come in and go out every week. With so much used commercial restaurant equipment coming in, it’s no wonder One Fat Frog Restaurant Equipment can sell it for so cheap. While other restaurant equipment dealers are out to wring you dry, One Fat Frog Restaurant Equipment is out to make sure you have a strong, successful restaurant that keeps its doors open. This week two premiere items One Fat Frog Restaurant Equipment got in are a 10-burner range oven and a single phase Taylor soft serve machine. Ice cream never goes out of style in Florida, so take advantage of One Fat Frog Restaurant Equipment’s super low prices and 30-day parts and labor warranty and get yourself this high quality, reliable Taylor soft serve machine today! I’ll take a chocolate swirl dipped in sprinkles and whiskey, please. As far as that 10-burner range oven goes, man alive could that bad boy crank out orders. Perfect for keeping up with your busiest periods with ease. One Fat Frog Restaurant Equipment offers an easy financing plan that anyone can be approved for. One Fat Frog Restaurant Equipment is the only used commercial restaurant equipment dealer in the nation with its own in-house finance manager – this gives One Fat Frog Restaurant Equipment the serious edge when it comes to getting you approved for the financing you need. 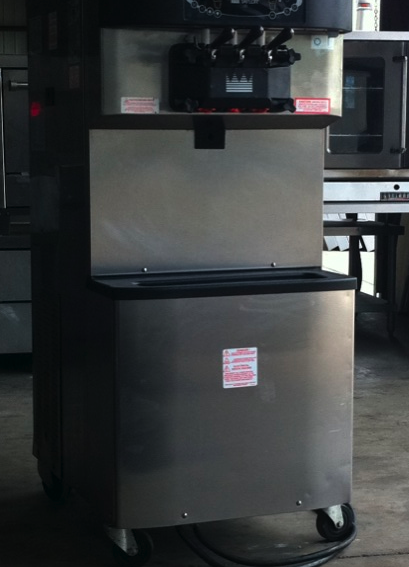 One Fat Frog Restaurant Equipment also welcomes quick cash deals and package deals towards the entire stock of used commercial restaurant equipment – including the 10-burner range oven and Taylor soft serve machine listed above.